Queen Ramonda (Angela Bassett) wears an isocholo that was created using a 3D printer. Black Panther’s costumes weren’t just the garb of King T’Challa (Chadwick Boseman) and the people of Wakanda. They were also a loving tribute to the art, history, and culture of several African nations. Now, the film’s costume designer Ruth Carter is giving an inside look at how she mixed tradition and technology to bring the film’s Afrofuturist vision to life. In a video for Vanity Fair, costume designer Ruth Carter dove deep into the costumes for two of Black Panther’s key scenes: T’Challa’s return to Wakanda, and the Warrior Falls sequence. The clip is about 13 minutes long but definitely worth staying through the end. Carter goes through every major character and tribe featured in the scenes, showing where the inspiration for their outfits came from... as well as how they modernized them to fit within Wakanda’s world. 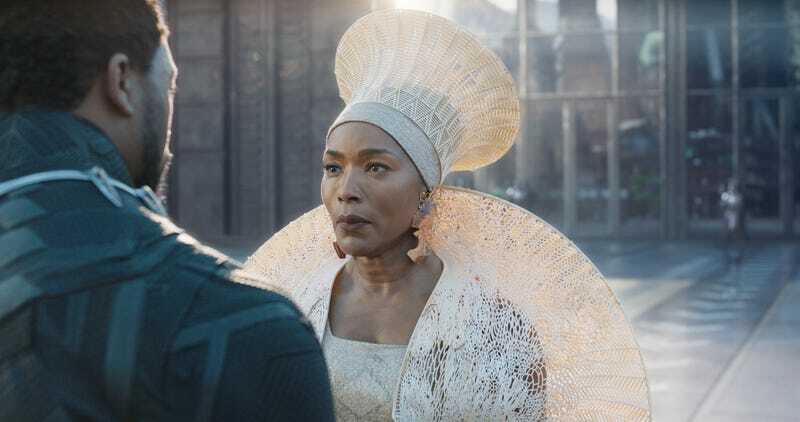 For example, the traditional hat, called an isicholo, and “shoulder mantle” for Queen Ramonda (Angela Bassett) were created with a 3D printer. Black Panther is currently out on digital and will get a Blu-ray release May 15.